We are highly experienced firm best known for our offered best in class CNC Bending Service. Our offered bending services exhibit our strong dedication to highest quality standards, and we benefit from a large group of technology experts who utilize the leading CNC based bending machinery to perform metal fabrication job work. 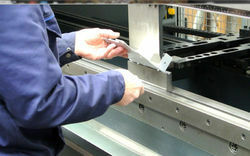 - Plate rolling /bending up to 5 mm thick mild steel/carbon steel/stainless steel plates having a width up to 3000 mm. We provide bending services of different materials by utilizing latest cut edge technology and machines. We are engaged in offering an optimum quality array of CNC Bending Service for our esteemed customers. Offered services are much admired due to their perfect execution and accurate results. Also, these services are rendered by employing highly experienced and knowledgeable team members. We have carved a niche amongst the most dominant names in this domain, involved in providing CNC Bending Job Work. We are involved in offering CNC Bending Services to our Clients. Supported by a well-experienced team of professionals and well-laid infrastructure. With the help of our team of adroit professionals, we render this bending service according to the exact needs of clients. - To assist in component design, sharan has an advance 3D CAD system to develop complex folded components and to model multiple-part assemblies. - CNC programs can be generated quickly and are stored electronically for future use. Our company is engaged in trading of laser cut & bend on CNC that are manufactured in sync with industry standards. The range can be custom designed to suit the specific requirements of the clients. Known for their precision designs and high efficiency, we are offering these cuts & bends at competitive rates. CNC Pipe Bending Facilities for manufacturing of 65 mm Dia for steering handles, frame assemblies & various other tubular parts. 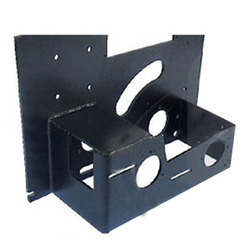 We hold immense expertise in providing our customers with excellent CNC Bending Job Works. Appreciated by the clients for their excellent tensile strength, our services provide accurate bending of metals. All our services are executed using advent tools & technology in adherence to the international quality standards.